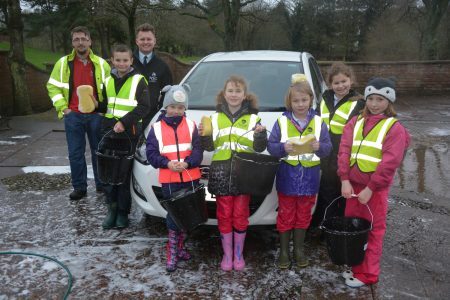 On Friday 5 February, NSG Environmental Ltd were delighted to support Seascale School Enterprise Club’s car wash at LLW Repository Ltd’s Pelham House office in Seascale. The event, organised for the Centre for Leadership Performance’s Bright Stars competition, was a great success and the children raised £192.42. The Enterprise Club also held a hot chocolate sale in January, raising over £100, and will be holding a Valentine’s Day-themed disco later this week. At the end of the competition, the total monies raised will be split between the school and their nominated charities, Water Aid and Seascale Community Beach Park Project. The support from NSG has been fantastic and we are thrilled to have been paired with them on this project for the second year. The ongoing support and the relationships built between NSG and our school has enthused the children and meant that our 2016 project is off to a flying start! The children are loving every minute of Bright Stars! NSG look forward to supporting the school again in the near future.